"After decades of isolation and a turbulent transition to democracy, Portugal's integration into the European Union has given political, economic, social, and cultural stability to a country that had to overcome the trauma of losing an empire. 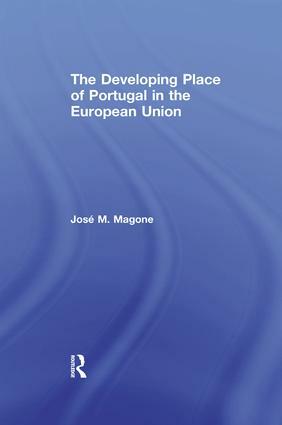 This volume clearly is a major contribution to the study of how Portugal became part of the European Union as a political system and its development towards Europeanization and domestication.Magone first lays a theoretical framework for the study of Europeanization and discusses political parties, the political system, and Portuguese society in terms of Europeanization. He then examines public administration, how the European Union and the OECD impacted on the modernization agenda, and includes a discussion of the national EU policy coordination. Magone also considers the Portuguese Euro-elite and how they interacted with the Portuguese presidency and the processes of decision-making going on among the different levels of the governance system of the European Union. He highlights a case study of the Portuguese presidency of the European Union, which took place in the first half of 2003. In addition, Magone discusses the impact of the EU structural funds on Portugal, and scrutinizes Portuguese foreign and defense policies, in particular its reconstructed foreign policy, which was clearly instrumental in achieving the independence of East Timor. He reviews the growing integration of Portugal into the emerging structures of the Common Foreign and Security Policy (CFSP), concluding with the challenges that Portugal will face in the future in the education, health, and business sectors.An interesting finding is the growing alienation of the population from the political class, who clearly make all the decisions in relation to the European Union without proper consultation of the population through referenda. In sum, this book is vital to understand one of the oldest nation-states of the world.JosÚ M. Magone is senior lecturer"